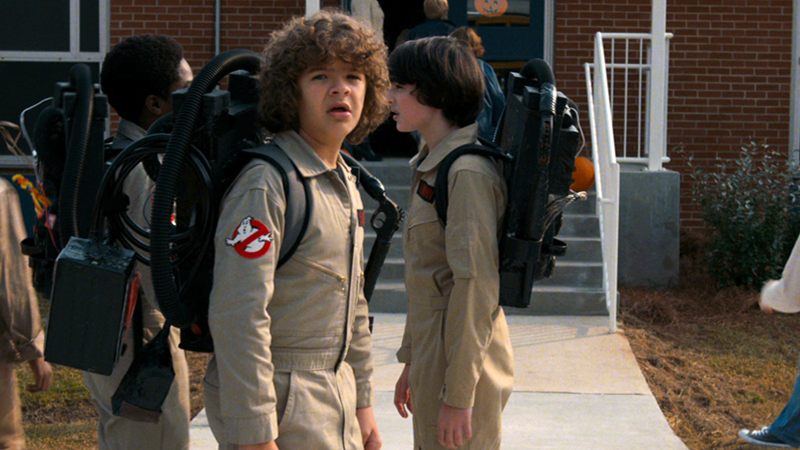 One of the first things we ever saw of Stranger Things’ highly-anticipated second season was Dustin, Mike, and Lucas all dressed up as the most gosh-darn adorable Ghostbusters in Hawkins, Indiana. It’s become one of the defining images of the new season—and the show had to get blessings from Ghostbusters royalty to use them. We got to talk to Ivan Reitman on the phone because he and Dan Aykroyd had to approve it. [Reitman] said it was flattering, he read the scripts. He had seen the first season or at least had heard of it or pretended like he had. But they were really into being part of the show. Then they sent us all these Ghostbusters toys at the end of the shoot. That’s one of my top 5 most worn-out VHS tapes. Some of the trailers have indicated the Ghostbusters costumes are more than just a cutesy bit of set-dressing for the show—in the first trailer, we saw the kids attempting to uncover something they’ve apparently ensnared in one of their homemade ghost traps. So it makes sense permission was needed, and was worth it in the end, because what sort of little kid wouldn’t have wanted to go as the Ghostbusters for Halloween in the mid-’80s?